A few months ago I wrote about why good markup matters. As a front-end developer, I interact with Drupal’s markup on a daily basis and I experience first-hand the benefits of good markup and the frustration of poor markup. A lot of the content on a Drupal website is produced by views. Whether they are out of the box or custom views, they are powerful and present us with great opportunities to manipulate the content and markup. 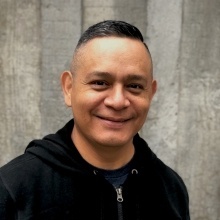 Today I will walk you through a simple example on producing cleaner and semantic markup using views. We will create a simple block listing the top ten articles in our website. For this example we will be working with a vanilla installation of Drupal 7. If you haven't already, download and enable the Views and CTools modules. Now that our view and block are done we can can display it on the right sidebar of our homepage. Under Region Settings, choose Sidebar Second. Be sure you do this for your site’s default theme (in this example, Bartik). The list looks nice, our articles are nicely organized. Let’s take a look at how things look under the hood. As you can see from the example above, something as simple as a list of items produces additional markup that frankly it is not necessary. In addition, the default CSS classes applied by Drupal could also be improved. Ideally we would like the list to be formatted as an unordered list with only the necessary markup. Let’s take a look at how we can clean up our list and also provide semantic CSS classes that will make our theming process much easier. Under Row Class, type top-ten-article (lowercase and hyphen separated). This will be the class applied to each list item on the list. 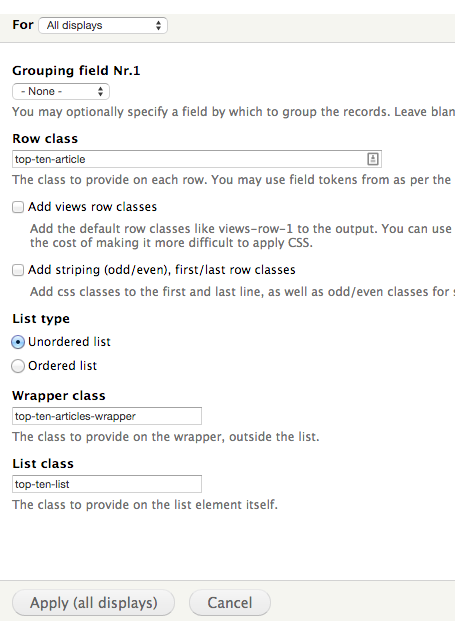 Be sure Add view row classes and Add stripping (odd/even), first/last classes checkboxes are NOT checked. By doing this we are removing the default classes added by Drupal. Notice I have opted to not add views row and odd/even classes. This is completely optional and in some instances these classes could be helpful. I added my own custom/semantic CSS classes to rows, list wrapper and the list itself. We are halfway there, let’s make one additional change. A couple of other changes I usually make to views are assigning the view a unique CSS class and custom machine name. 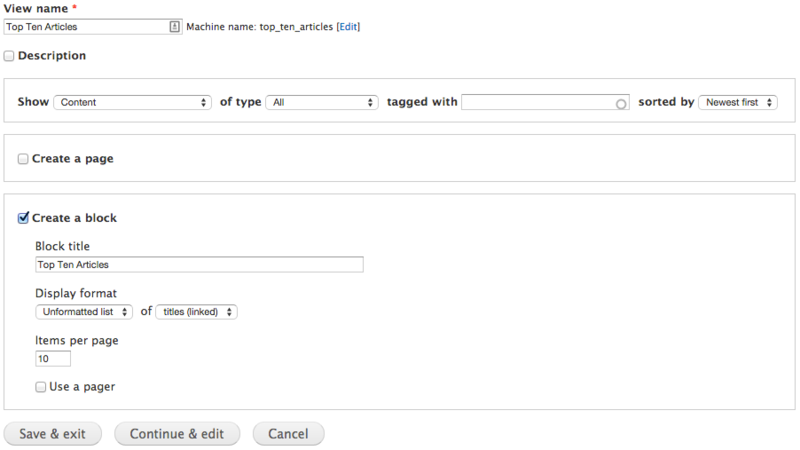 For Machine Name, type top_ten_articles_block: This gives your block a friendly machine name. Be sure to use lowercase and underscores. A custom CSS class to the entire view can be very handy when theming as this could help you remove unnecessary nesting in your rules. Note: Notice the machine name string uses underscores(_) as this is only for machine purposes. The machine name settings is purely optional but it may come in handy when writing custom code. Save your changes to the view. 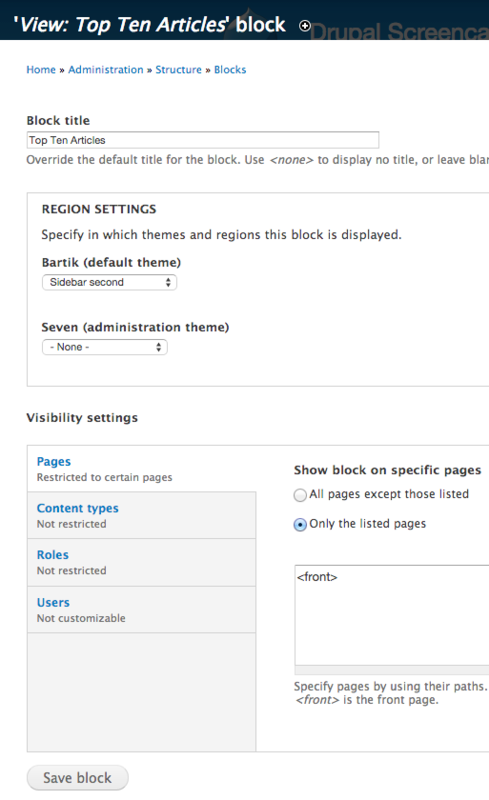 After saving all your view changes, navigate back to the homepage and take a look at your new Top Ten Articles block. Visually the list doesn’t look much different than the original with the exception of the bullets on each item. Personally I think lists should be formatted as <ul> or <ol>. It’s a good practice for visual reason as well as SEO and even accessibility. We were able to eliminate the extra wrappers on each article title as well as wrappers around the entire list. In addition, we now have quite a few custom/unique CSS classes we can use to better target our view when theming. We could actually take this further by editing the view’s tpl.php template being used, but we can do that in a future post. By using semantic CSS classes we can theme our view without specificity of selectors inheritance, this means we can write more modular CSS to make components reusable if needed. Other benefits as I indicated below are SEO, content that is better formatted based on the type of content is well received by search engines. and last but not least, accessibility. Screen readers will be able to easily read through a list that is perfectly formatted with only the necessary amount of markup than a river of divs with absolutely no meaning. Stay tuned for the next article of this series where we will bend views to our will by writing our own custom markup.